The Al Teglia Jobs for Youth Scholarship Fund was started in 2005 as a way to provide college and vocational scholarships for San Mateo County Youth. It was named in honor of Al to recognize his lifetime of community contributions. Born Albert M. Teglia to Italian immigrant parents in 1931, he graduated from Jefferson High School and the College of San Mateo before a career of tireless advocacy for children and families in the County. Affectionately known as “Mr. Daly City,” Al championed community service efforts as part of the County Human Services Agency and Peninsula Works in Daly City. 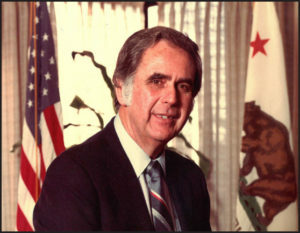 He helped establish and support numerous programs including: Jobs for Youth; Children’s Fund; Peddler Program; Reprogrammed Computers; Adopt-a-Family; Dental Programs for uninsured children and seniors; Daly City’s Clean Community Committee and Community Recognition Program. Today, we are proud to honor Al’s incredible legacy of service to the County by providing educational opportunities to the next generation of community leaders. Our annual breakfast event carries that spirit forward, as a way to both recognize scholarship recipients and connect them with the incredibly generous sponsors who are making their dreams come true.